A classy piece of furniture, the Fabio Real Leather Stool Black has retro styling that gives character to any location. Simple yet suave, the Fabio brings a sense of luxury to a modern design, ensuring it is a wonderful item for a multitude of settings. 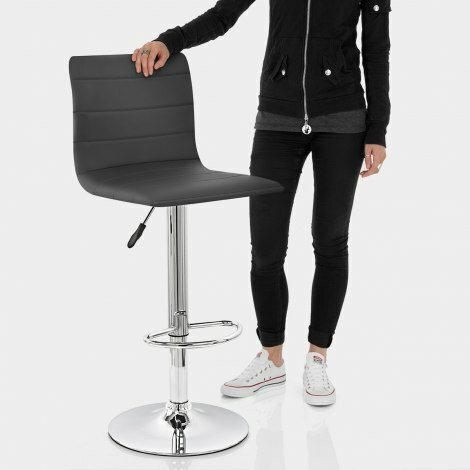 The comfortable, padded seat showcases a tall and supportive backrest; covered throughout in soft black real leather and stitched into horizontal sections that add superb visual detail and consolidate the upmarket feel. The chrome plated frame below includes a gas lift mechanism that gives variable height and 360 degree swivel, housed in the footrest section that raises and lowers with the seat above. The sturdy base has a conical cross section for high stability, whilst a protective pad below helps keep your floors in pristine condition. "Excellent quality and very comfortable"
Purchased to go at my new kitchen island. These stools are lovely nice soft leather. Good service and product at a good price. Easy to assemble. Ordered 2 stools and they arrived on schedule, well-packaged and just what I was looking for. Sleek, comfortable and perfect for my kitchen. The stools arrived quick and on time. Easy and quick to assemble. Tools provided. They look classy, modern and very comfortable. Worth every penny.